Rochdale One was a former Sovjet cruiseship, built at the Dubigeon-Normandie wharf in Nantes, France. Normally, the Sovjets built their ships in classes, but this ship is just one of a kind, having no sisterships. She was built under her wharfnumber 144 and delivered to her owners the Sovjet Danube Shipping Company at the 25th of august 1977. The ship was named Ayvazovskiy by the wife of the ambassador of the Sovjet Union in France and started sailing the Black Sea and the Mediterranean. In the 1970's, her cruises were sold in a package with a rivercruise on the Danube, ending in Constanta. Here, passengers could transfer to Ayvazovskiy. She was a rather small ship, just over 120 meters in lenght and she had a tonnage of just over 7000 BRT and carrying 328 passengers. In 1991, the Sovjet Union collapsed and all shippingcompnies of the former Union got into some difficulties. The ships used to belong to the state, managed by these companies, but now the state would not be involved anymore so the companies had to restructure. A lot of ships were laid up and wages were not always paid for the crewmembers. In april 1996, the ship was chartered to the German Phoenix Reisen for cruises in the Mediterrannean out of the Turkish port Antalya. For this, she was renamed Karina. Because of some financial problems within the Danube Shipping Company (the word Sovjet had been dropped since 1991) the ship was arrested in port several times during this period. In the year 2000 she was eventually sold to Multiway Shipping Limited of Limassol, Cyprus. She was leased to the Israelian company Primexpress Cruises and sailed as their Primexpress Island out of Cyprus for the next two years. She was laid up in september 2002 in Limassol because her bookings were low and her bills were not paid. At the same time, three Amsterdam based housing associations (Rochdale, AWV and DUWO) were interested in using older and out of service cruiseships and ferries for the housing of students. Amsterdam coped with a fast shortage of livingspace for this group and the council of Amsterdam one time even considered bringin up to 500 of these ships to the city's waterfront. So at first, they started looking in Eleusis Bay, Greece, where hundreds of these ships are laid up. Most of them were in such bad state that the associations could not find any ship that could be good enough restored for the purpose. Eventually, also the Primexpress Island was considered and this vessel, although in bad shape too, could still be restored. The ship was towed to Greece in march of 2004 but because all workers of the yard were needed to make preperations for the Olympic Games in Athens, work could not be started. Because of this, the ship was made seaworthy and then brought to Amsterdam where work could be finished. 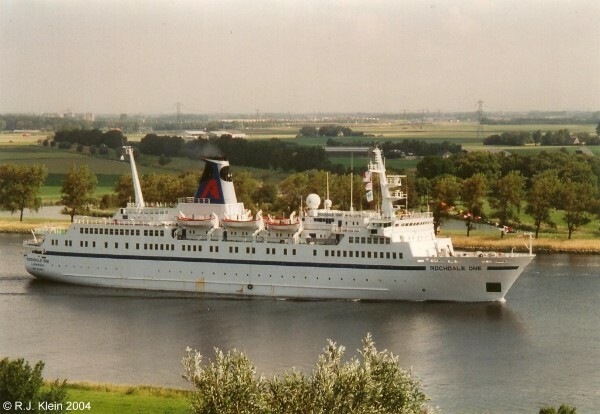 She arrived in Amsterdam at the 8th of july 2004 and was rebuilt at the Shipdock facility in the northern part of town. The picture above shows her at the Northsea Channel closing in at Amsterdam. At the 20th of september, the first students arrived and she had her mooring in the Houthaven, close to the city center. For this purpose, she was renamed Rochdale One, indicating that the company was still looking for other cruiseships in time. The ship still has a captain and four crewmembers on board and also her engineroom is kept neat so she could be used as a cruiseship again when her duties in Amsterdam were finished. Some problems arose because there was still asbestos inside, but this was removed and the ship was declared safe to live again. In august of 2009, Rochdale One was moved to Shipdock again for a long maintainance program. Also, the Houthaven was not the place she was going to return to, because the city had other plans with her former mooring. Her stay at Shipdock was to be a lenghty one, awaiting a new mooringsite, possibly on the northern part of town. The picture below shows her at her former mooringsite in the Houthaven in 2009. On the 28th of august 2011, Rochdale One left her lay-up berth at Amsterdam in tow of the ocean-tug Neptun 9. She was towed to Rotterdam where she was later sold to a company from Lebanon, based in the harbourcity of Tripoli. Although reports about her new role in Lebanon are very uneasy to find, the ship was towed to her new home in the middle east late 2011. It did not seem that the ship was really used in one form or another in Lebanon, as it was reported that she finally sailed for Aliaga, Turkey in the end of july of 2013 to be scrapped.